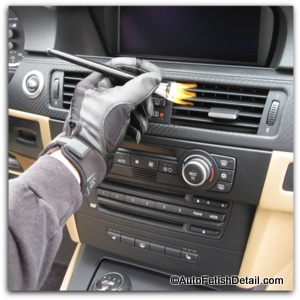 How to clean car interiors is a major concern for any car owner. The good news is you have come to the right place! I am about to use my 30-plus years of professional auto detailing experience and help you filter through the hype, the bad information, and the endless opinions of all the so-called experts and show you how to go from where you currently are, to success! Far easier than you think! Despite what you have been told or what you think, cleaning your car upholstery is easier than most people realize. Forget about the heavy duty carpet extractors, the specialized products, and specialized tools. I am going to break this down to simple, easy, and effective. All these cleaners are going to be what you will be up against. Most people like yourself will soon become overwhelmed at all the choices trying to decide which cleaner is safe or appropriate for the type of material in your car you are trying to clean. Yes, there is good news. You seriously need only a single type of cleaner. How to clean car interiors really can be as simple as a single cleaner. Just remember that based on the manufacturer, this single type of cleaner can be called many things, but ultimately are all the same: An all-purpose cleaner. And just like the name implies; it can clean virtually any material, and most surfaces within your cars interior. Next step will be to decide your needs based on you and your world. For most of you reading this, a single, sprayer bottle of cleaner will work just fine. But with that said, I have laid out additional choices for those of you looking to get more cleaner in a more economical size. If you are entering the world of professional detailing your needs are going to be different. Instead of cleaning the car interior of just your own car9s), you will be going through much more interior cleaner and therefor buying in bulk will make more sense due to the cost savings. One of my favorite car upholstery cleaners suitable for all your car interior cleaning. Concentrate so you can custom blend based on level of dirt. Not just for professional detailers but anyone looking to do more cleaning, not less. Another one of my top picks when it comes to how to clean car interiors. Concentrate so you can custom blend. Economical concentrate for more cleaner versus the ready to use interior cleaners above. The right car interior cleaner is obviously the starting point when how to clean car interiors is your goal. Finding and using the right tools for the job will be your next priority. If I had to live with a single car upholstery brush I could certainly live with this. Versatile: not too stiff, but stiff enough to be effective. Safe for any material in your cars interior for cleaning: velour, carpeting, cloth seats, and even leather. Remember, you remain in control based on how aggressively you scrub and the amount of pressure you use. My second most favorite interior scrub brush. Compact head to reach tighter areas. Handle allows you greater leverage for tough areas to reach or when more aggressive cleaning is needed. Stiffer bristled brush than above. Ideal for heavier cleaning needed for most floor mats. Natural horse hair brushes are softer than the nylon brushes above. Just like a lot of areas of life; you have this thing called the ripple effect. Typically how to clean car interiors will start with the obvious areas and quickly bleed into the other details of your cars interior. And when it comes to the more intricate areas of your car, you will also need the appropriate tools for this type of cleaning. I often find myself going outside the detail industry to find the perfect tools. These make-up brushes will give you an endless assortment of dusting and detail brushes for every job possible. Ultra safe fro any surface you will find in any car. Decide which area of your car you want to clean. Break areas down into sections and focus on each section at a time. Scrub area with your chosen scrub brush to break up dirt. Remember to be realistic when attempting to clean car interiors. Your carpeting and seating may be so neglected that if these were in your house, you know you would simply want to replace them as cleaning them would appear to be unrealistic. But I get it; replacing car interior parts is both expensive and in many ways unrealistic. Also know that despite how dirty your car interior may be, you will be greatly surprised how these products and tools will perform for you if you apply a little elbow grease. I promise a short while in your car, armed with these products and tools and you will be completely impressed at the results you will get even if you are unable to obtain perfection.